Pilates exercise combines a sequence of smooth, controlled movements that place minimal strain and load on joints. 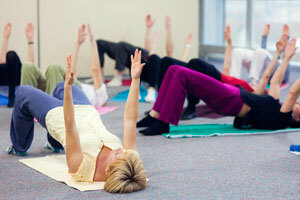 Pilates is a low impact system of exercises that focuses on improving core stability, flexibility and general health. The varied exercises encourage muscles to work in unison, creating smooth and efficient movements while minimising impact and load on joints. Research shows that Pilates can improve posture and body tone, balance and flexibility, pelvic floor function, and assist with preventing and treating injuries. It is also a suitable activity to transition into more intense exercise following injury, or as an ongoing management strategy to maintain strength and function. Pilates is often used in conjunction with Physiotherapy to treat injuries, specifically those of the neck and lower back regions, to improve performance in more high intensity sports and is also suitable for pre and post-natal health. Facilitated by qualified Physiotherapists who understand anatomy and pathology, our Clinical Pilates classes are run in the clinic’s gym area and are limited to a maximum of 10 people per class. This enables a safe exercise environment and close individual attention to technique as well as modification of exercises to suit individual needs. To map progress, each term two specific exercises are chosen as the focus, classes are then modified with additional exercises to help strengthen the chosen areas. All classes are held at the City Centre Clinic. If a more individualised program is required or a patient prefers a one-on-one session, the individual sessions offer this service which allows for a greater focus on form and function, and a more personalised experience. Every session can be adapted and progressed according to the client’s needs. If you are a new patient to the clinic, an individual assessment will be recommended prior to commencing the classes.